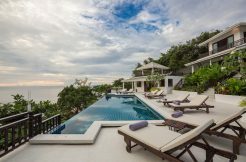 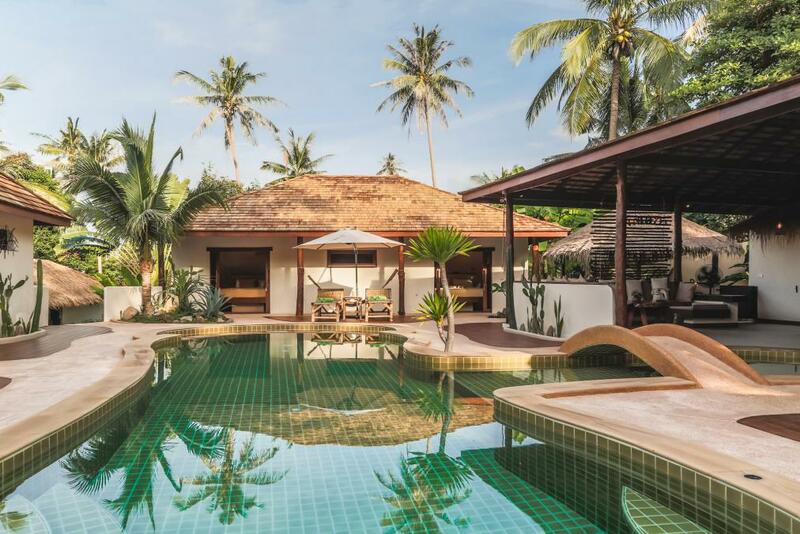 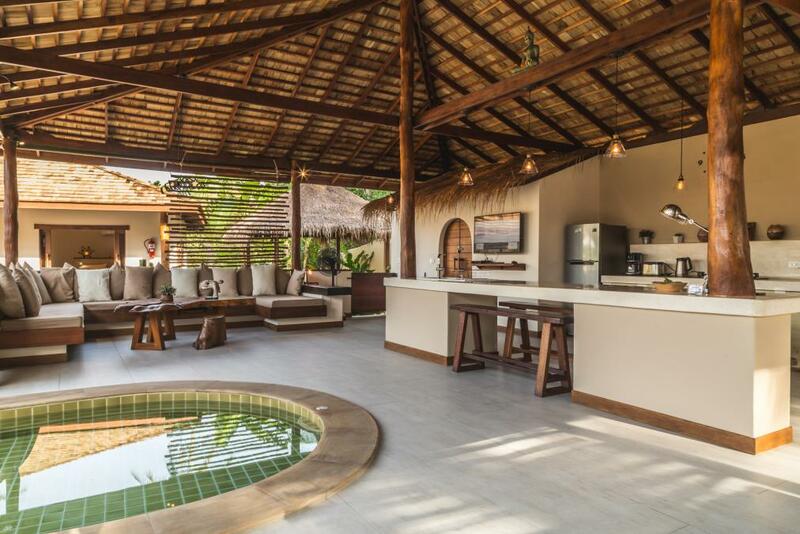 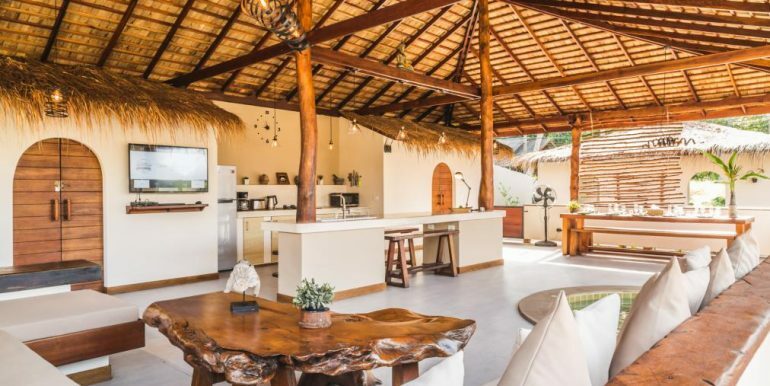 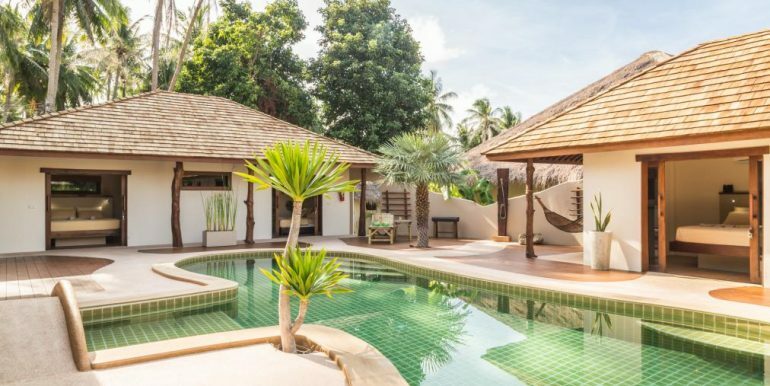 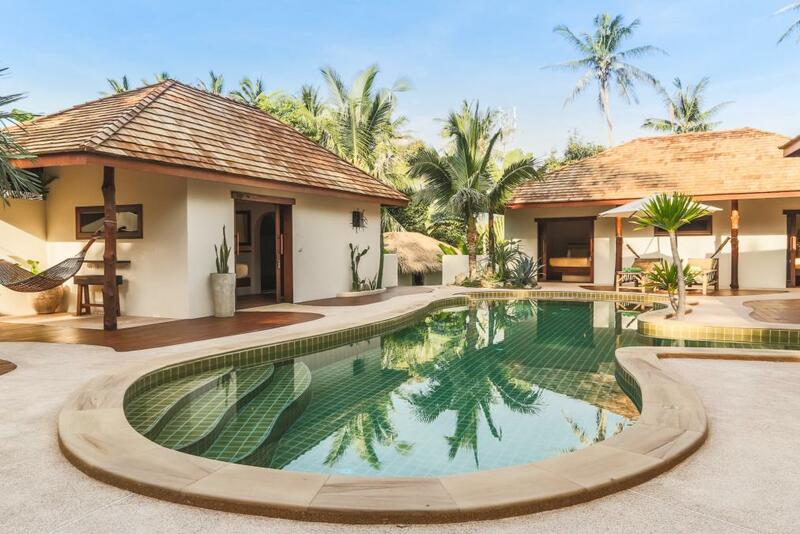 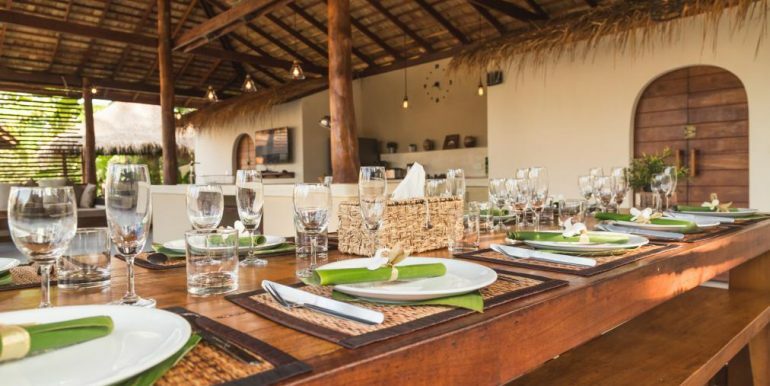 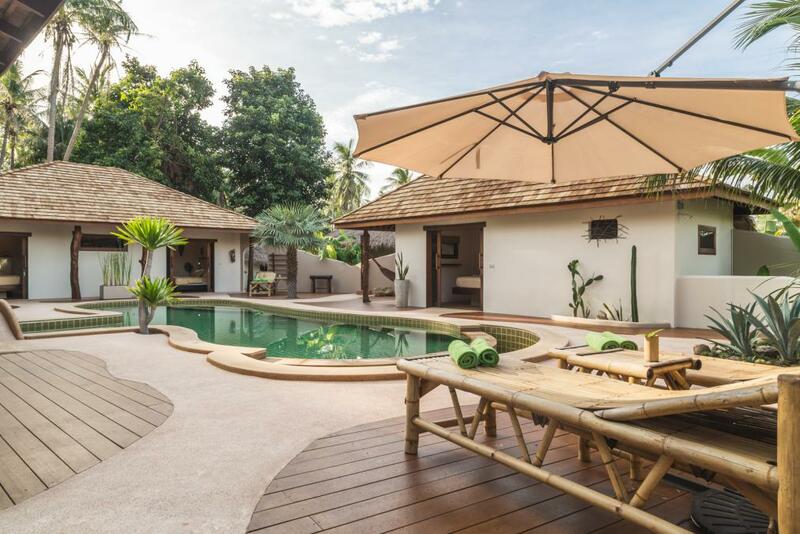 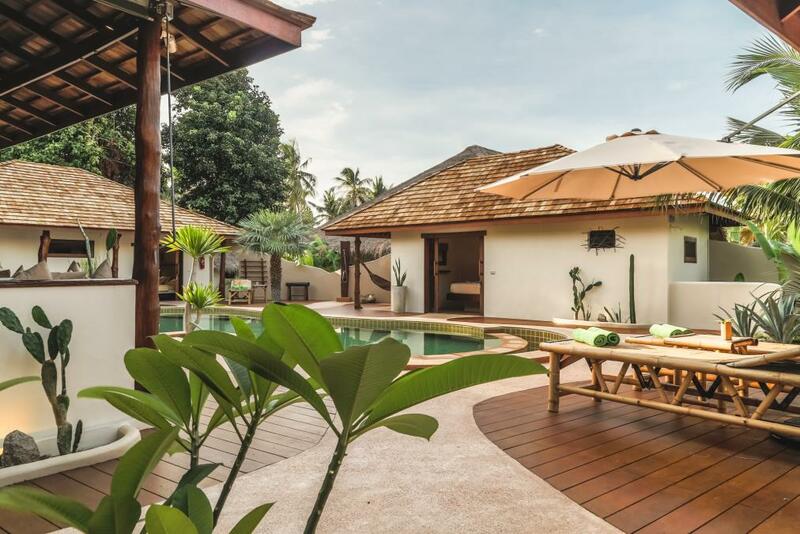 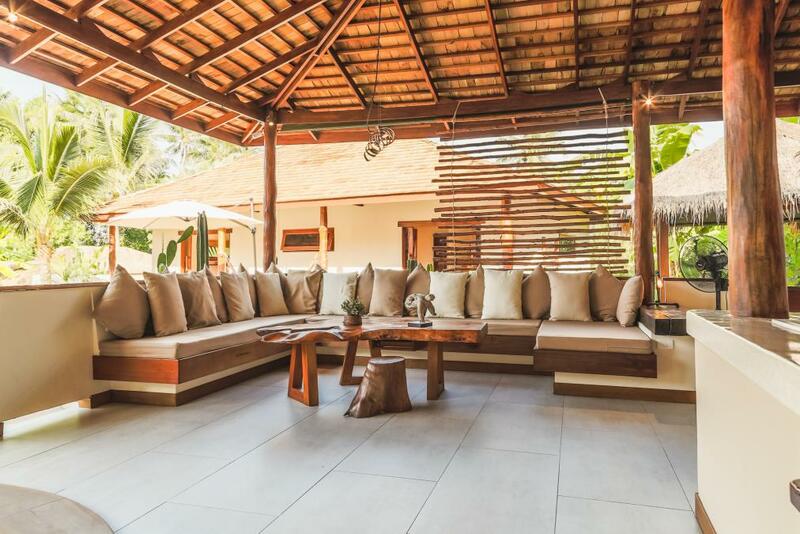 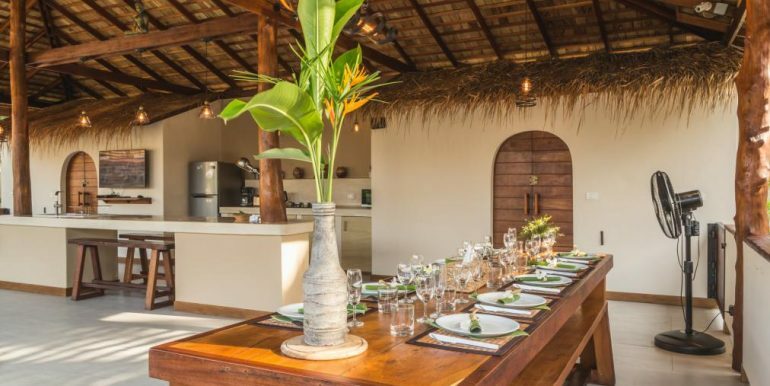 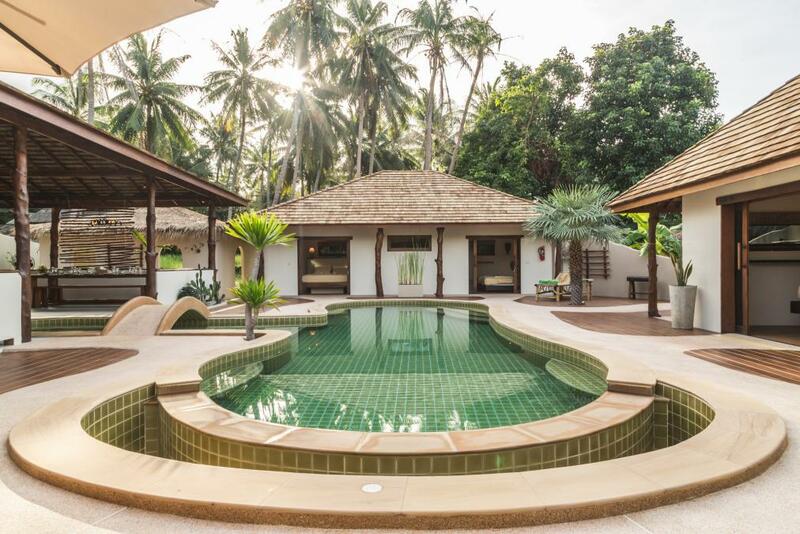 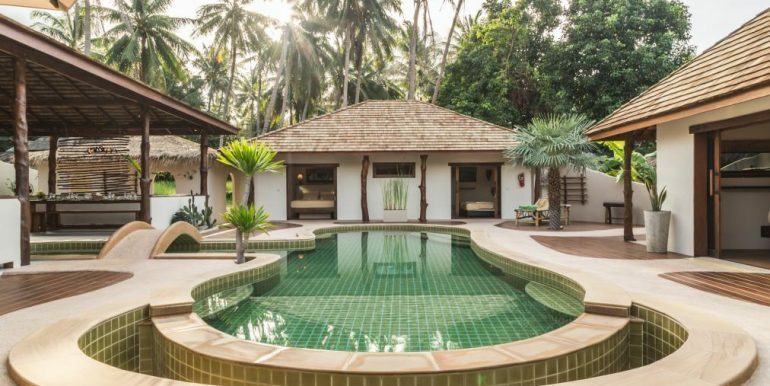 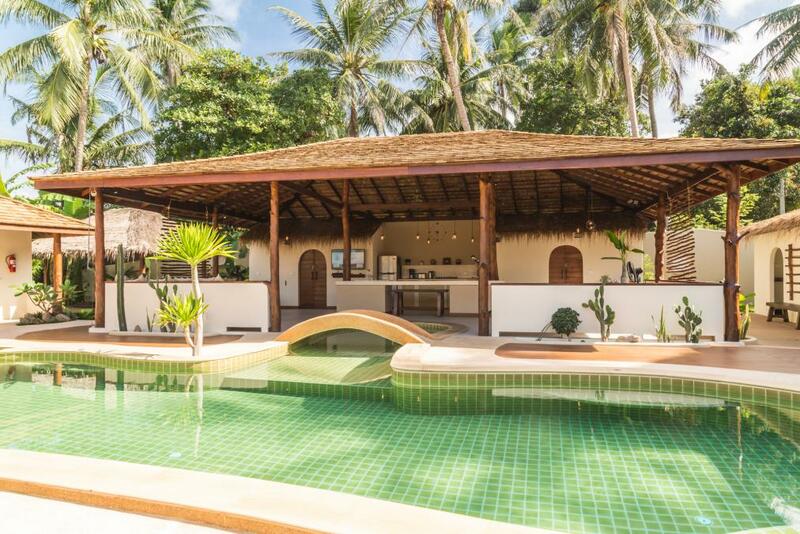 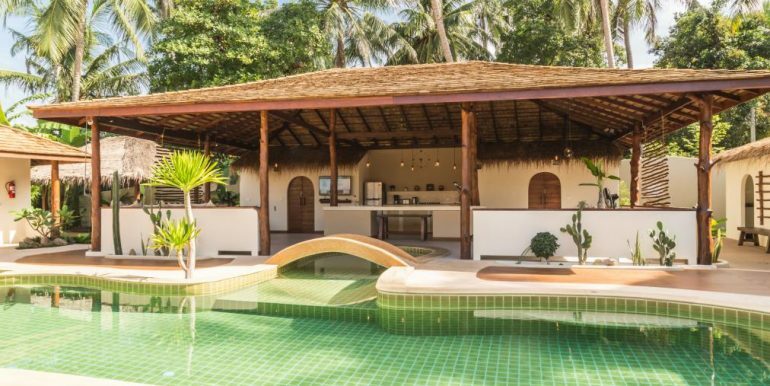 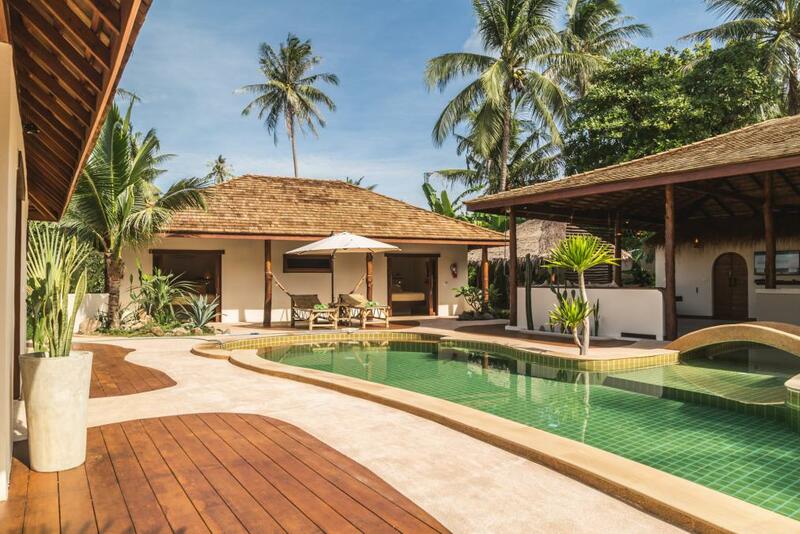 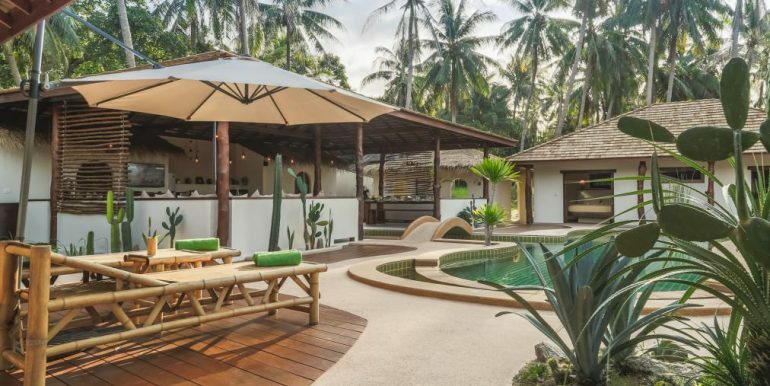 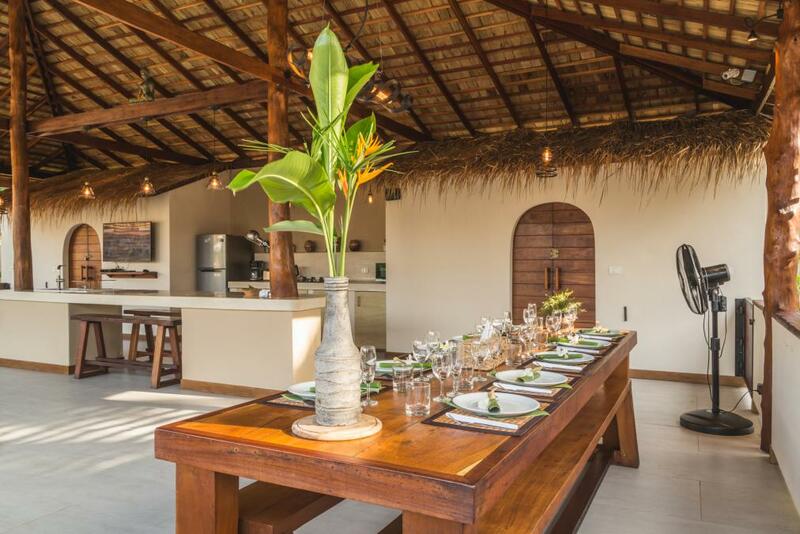 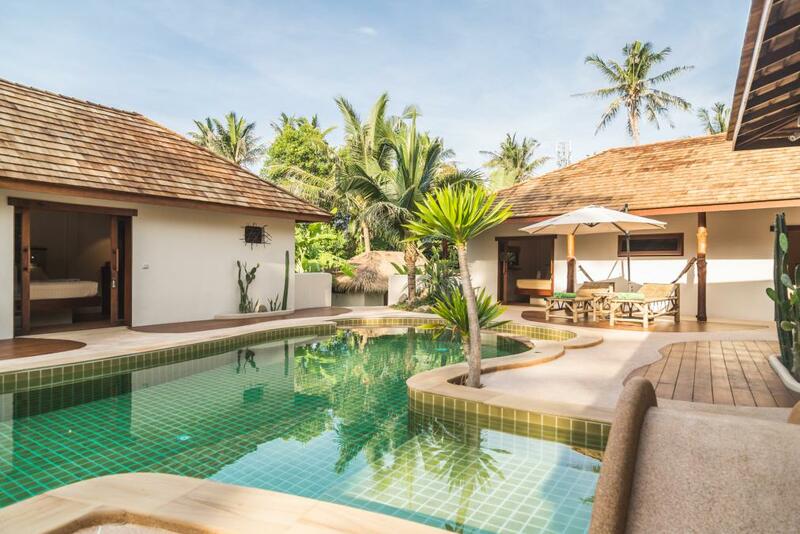 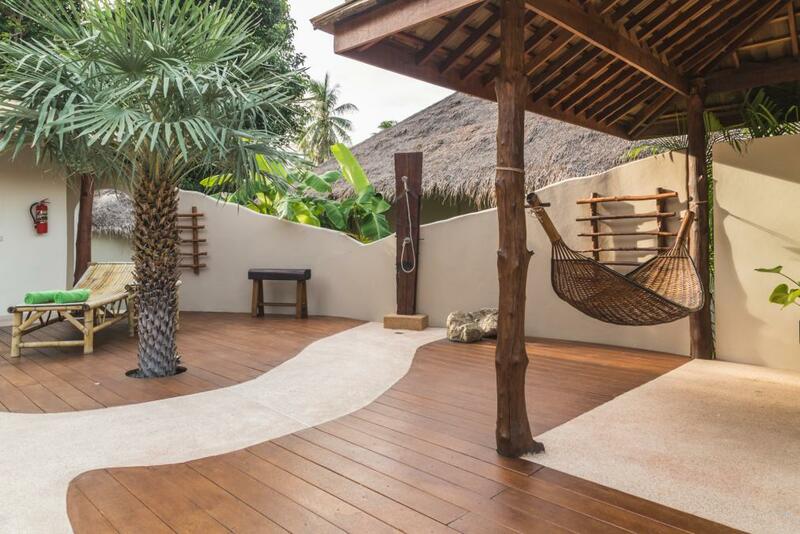 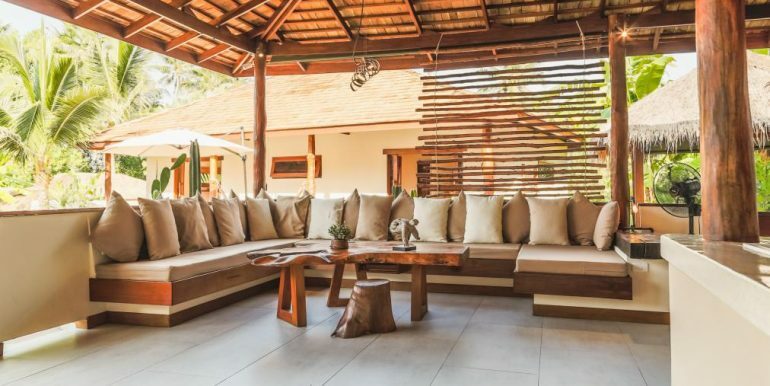 Baan Ya Kha Villa is a like a private resort style accommodation with 3 bungalows and an open plan living area, dining and kitchen. 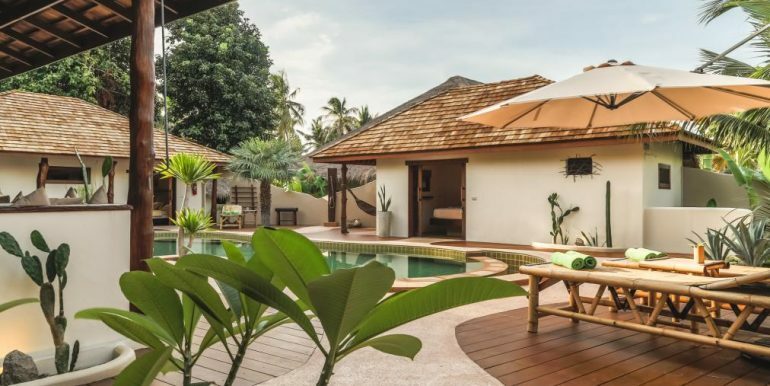 The location is near the village of Sri Thanu. 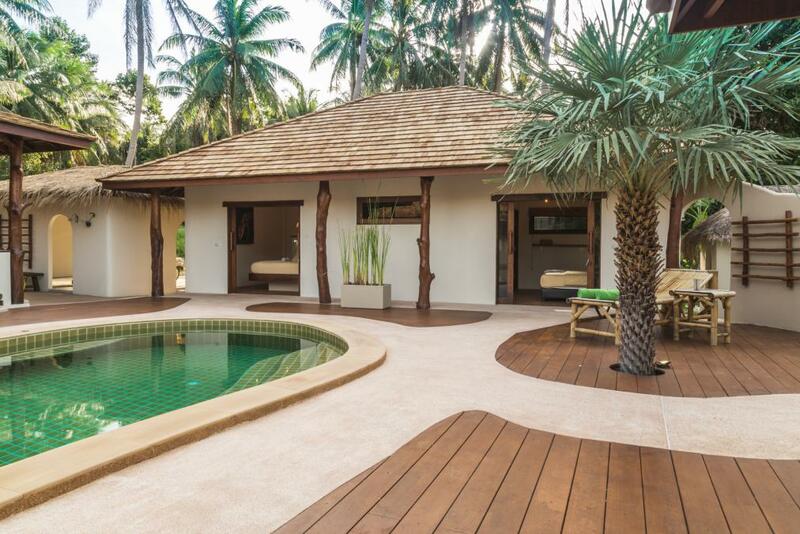 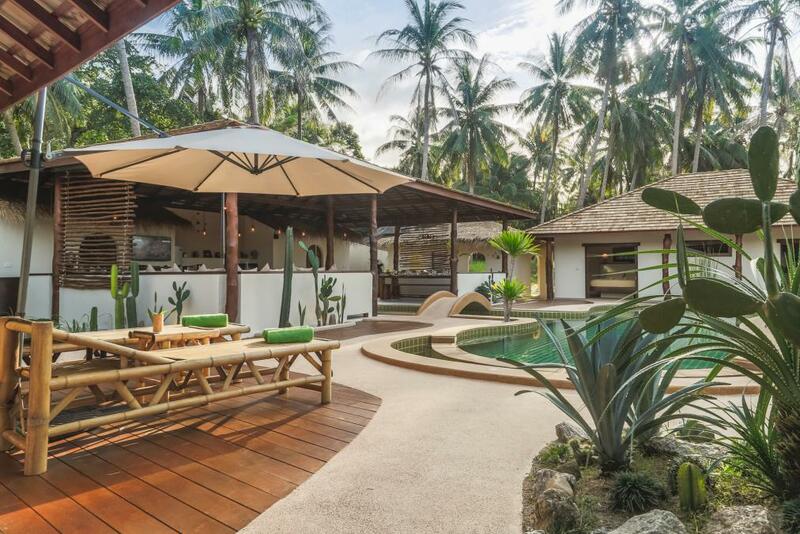 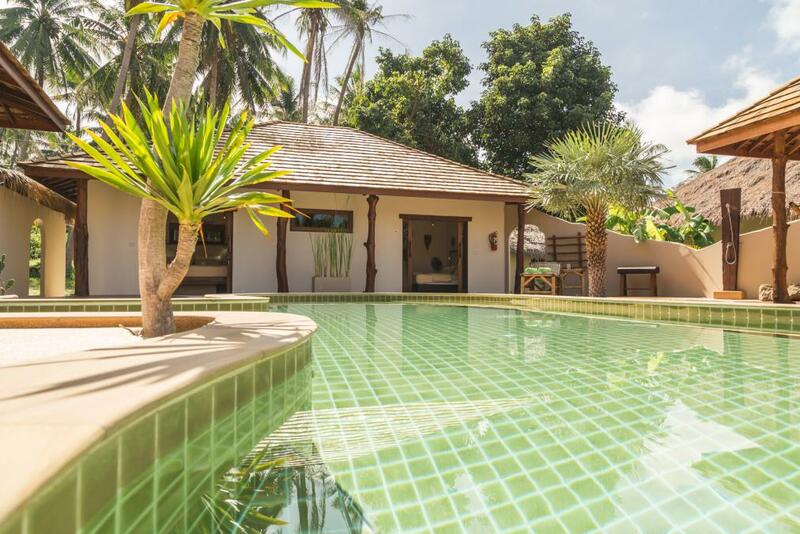 This villa is next to Baan Yai Villa. 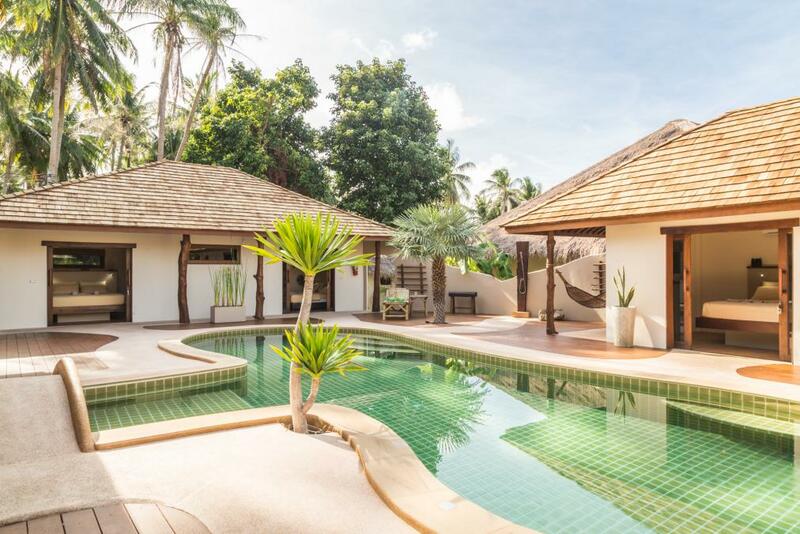 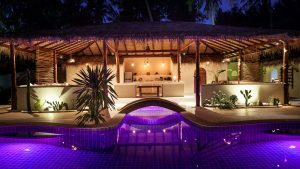 Three nice bungalows and an open plan living area are set around the swimming pool of 13 meters by 5 meters to create a stunning setting. 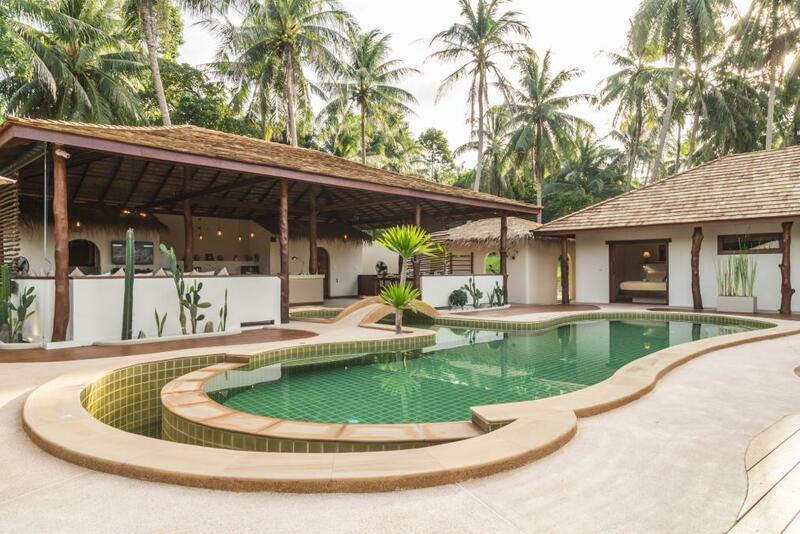 The swimming pool has a shallow part that goes into the living area, with a small bridge over it. 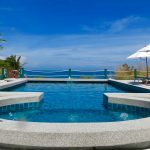 This makes a perfect place for children if they want to swim while you sit at the dining table or even for adults to chill-out and still be within talking distance of the dining table. 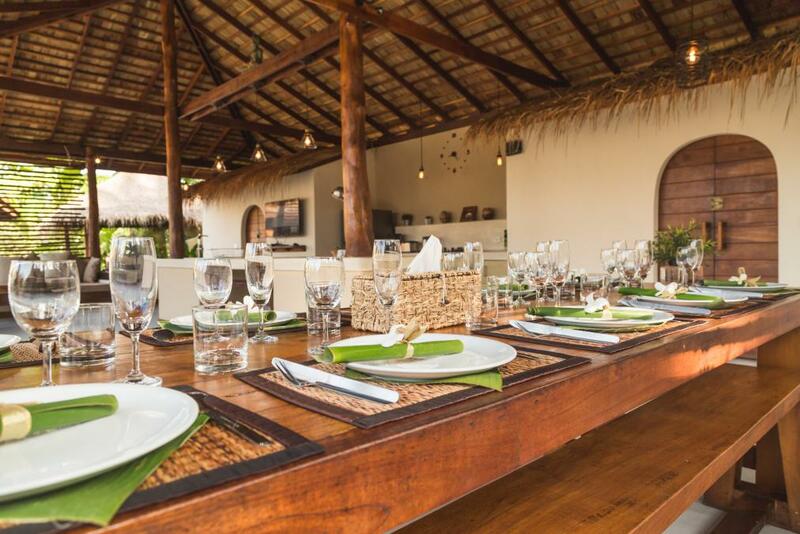 The dining area offers a table to seat up to 12 people. 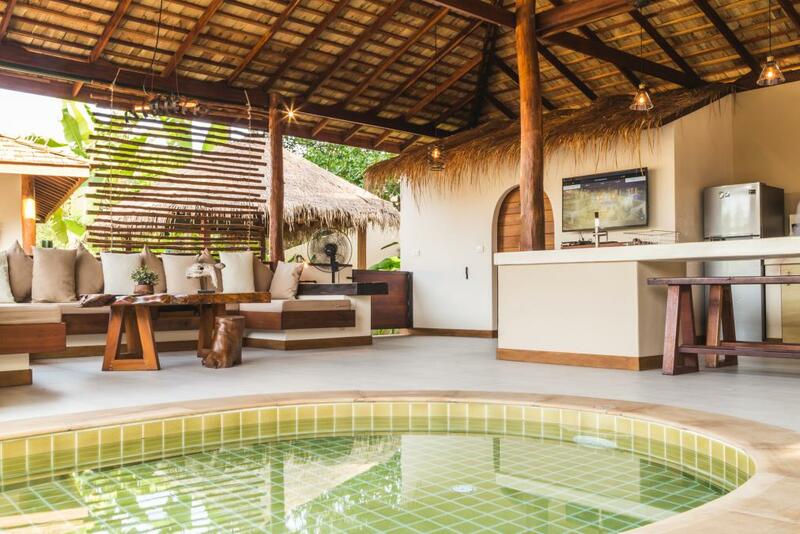 The large lounge has a comfortable sofa that can also seat up to 12 people with a 50″ Smart TV with international channels. 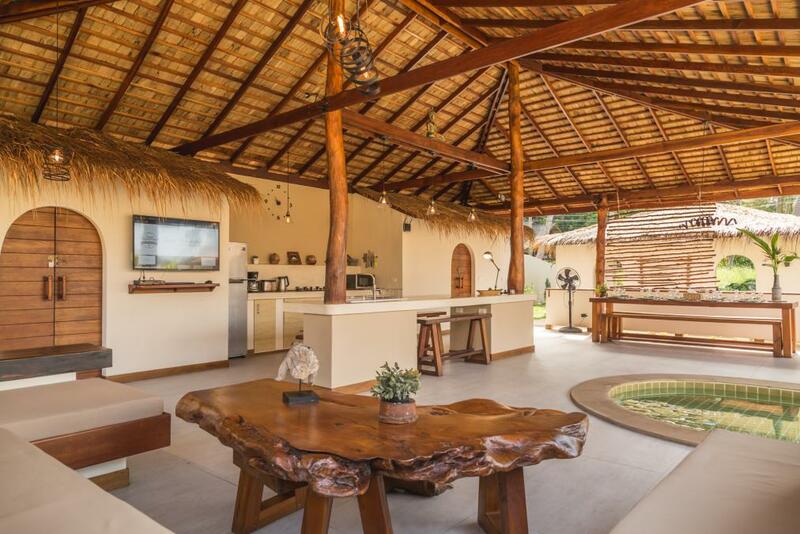 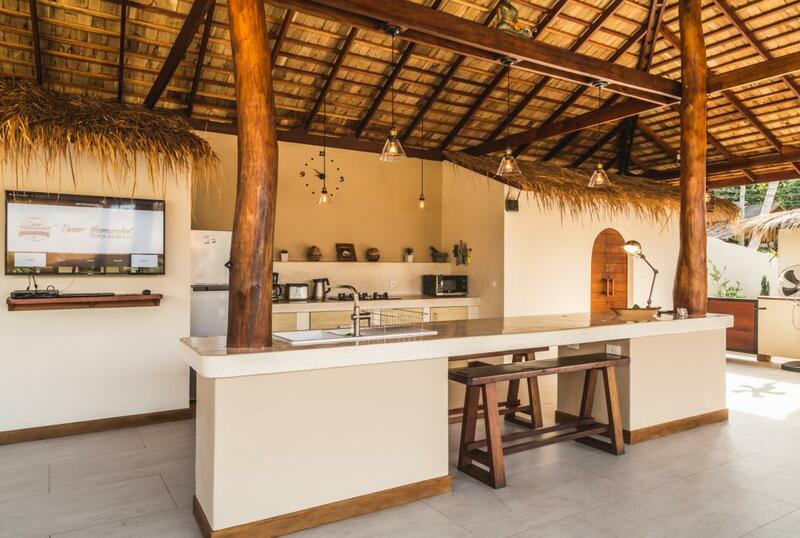 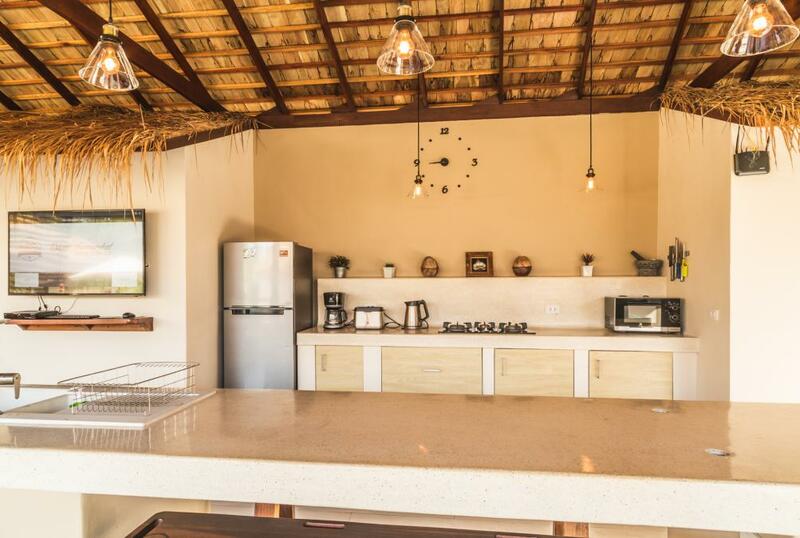 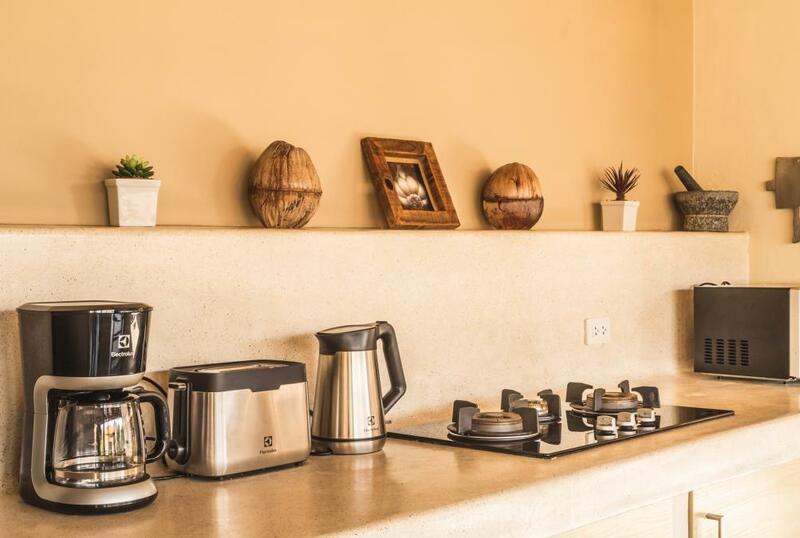 The center of this area has an open plan fully equipped kitchen with bar area. 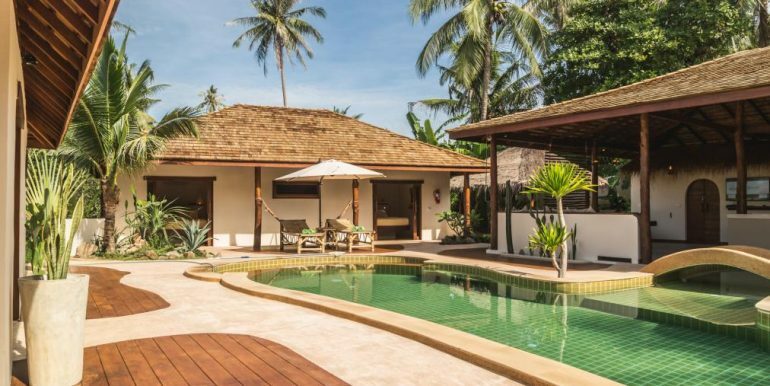 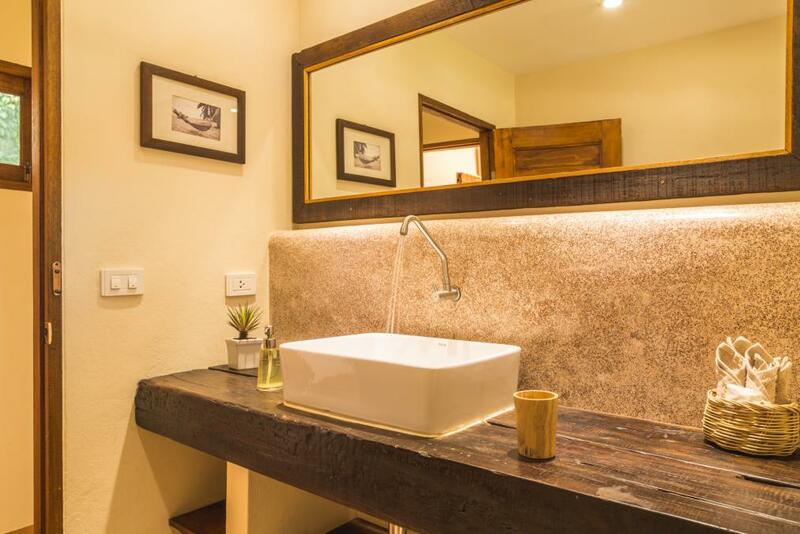 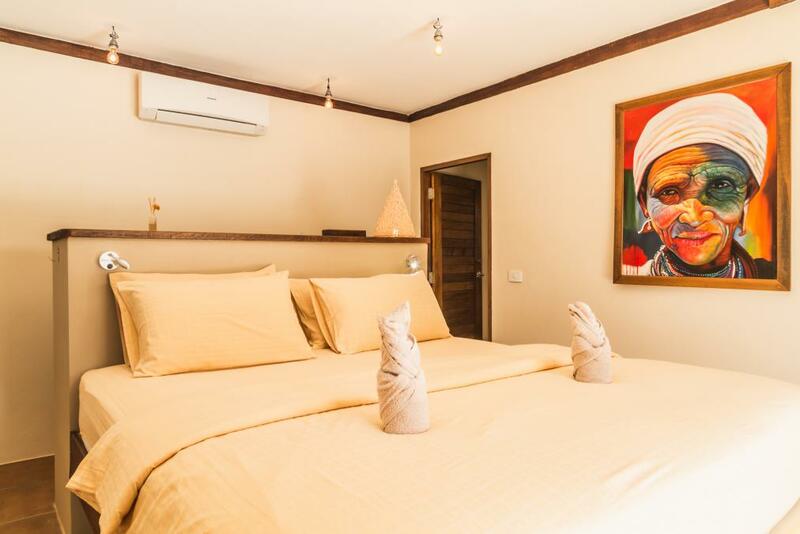 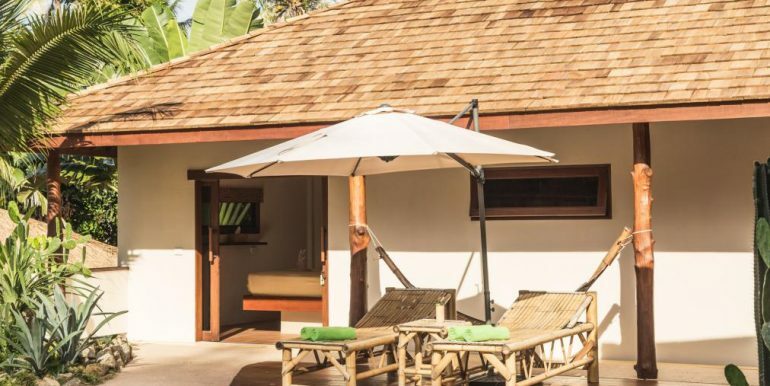 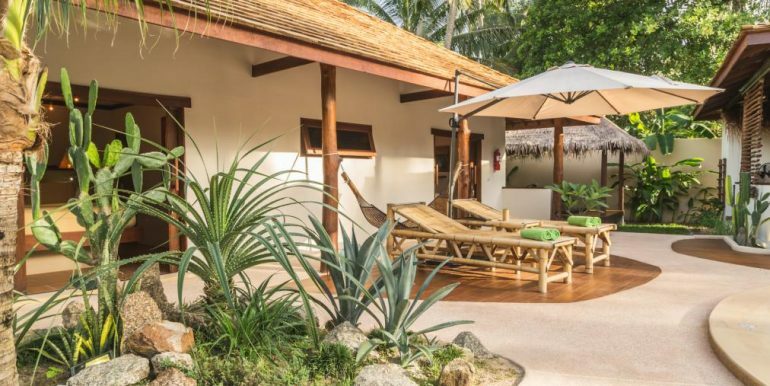 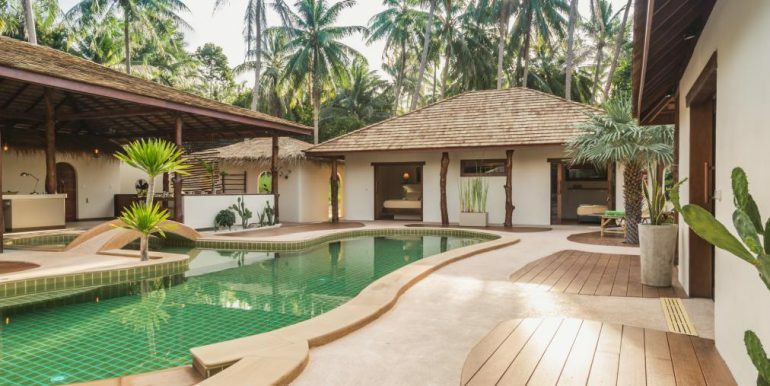 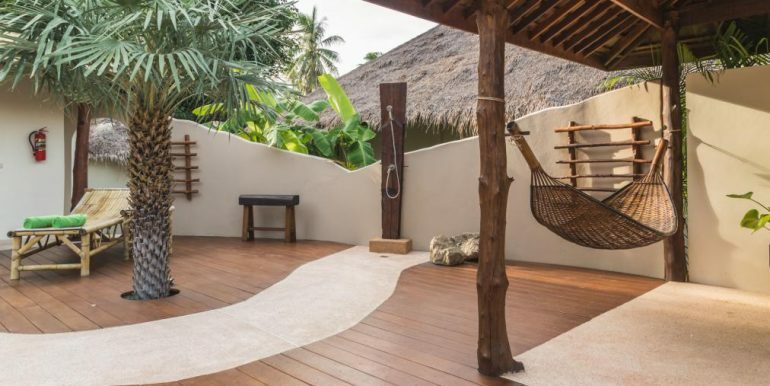 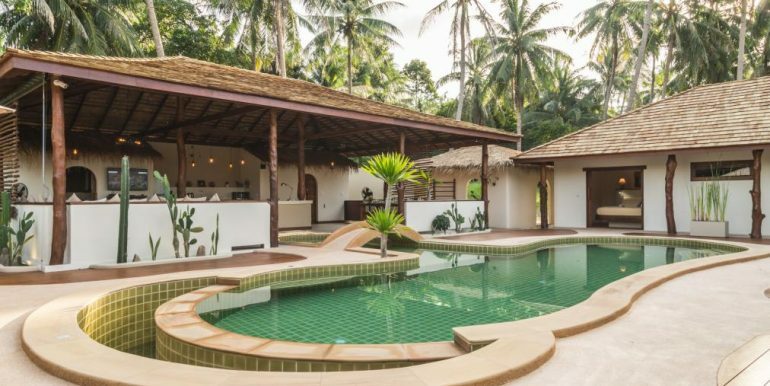 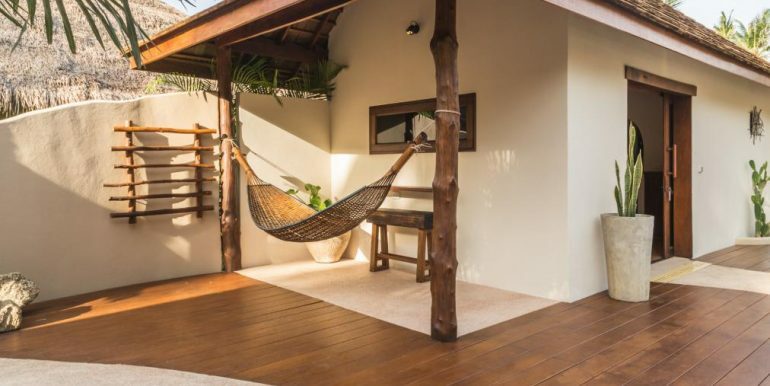 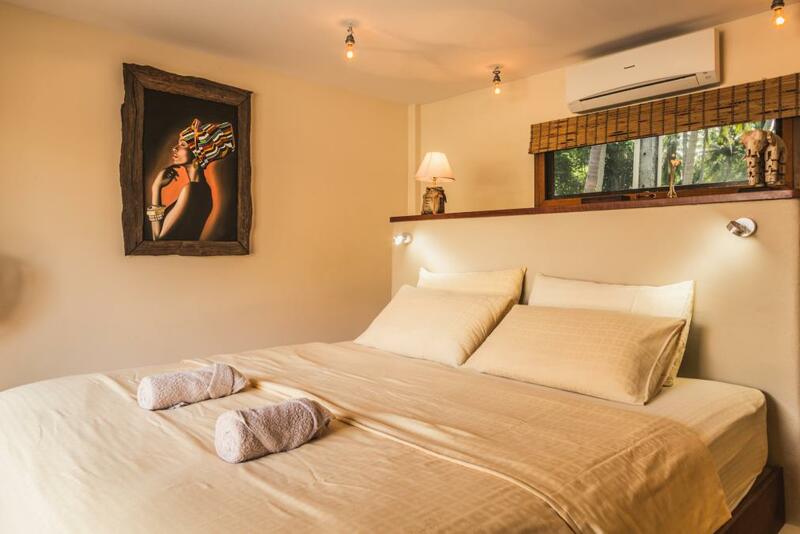 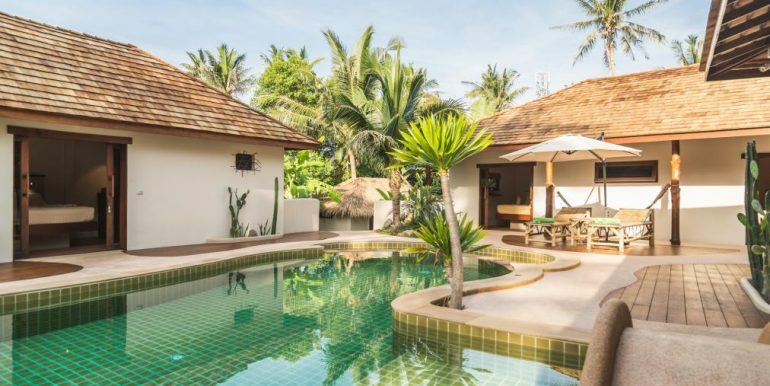 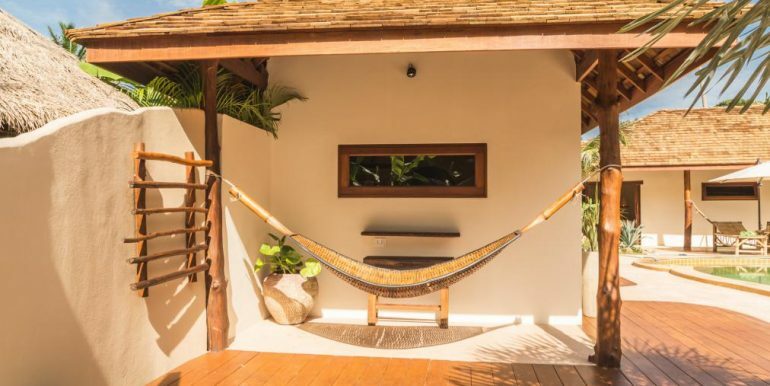 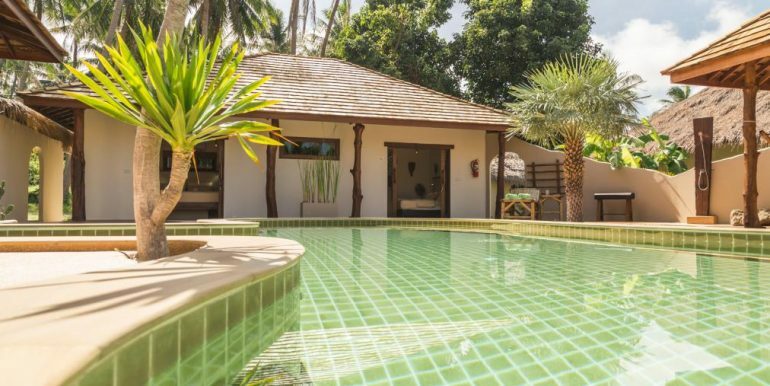 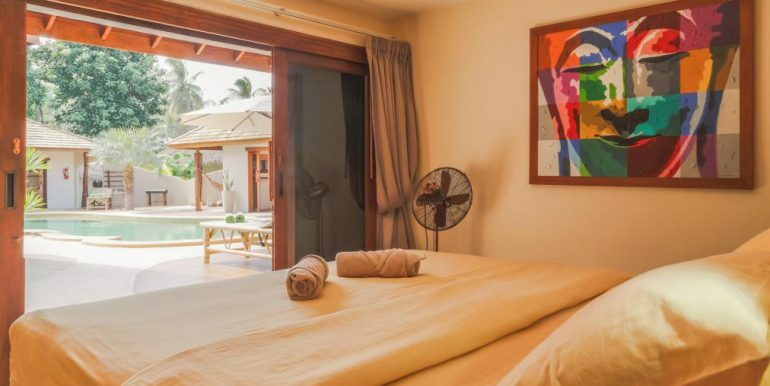 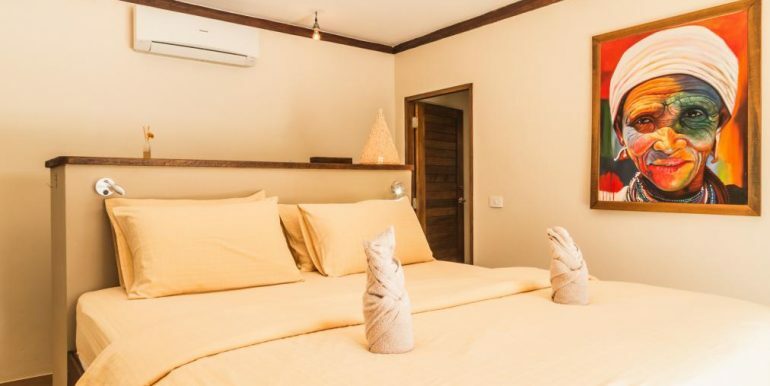 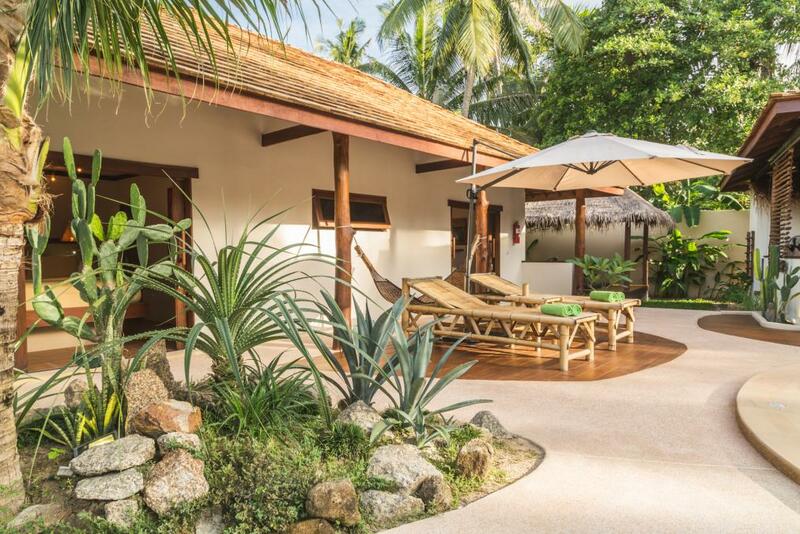 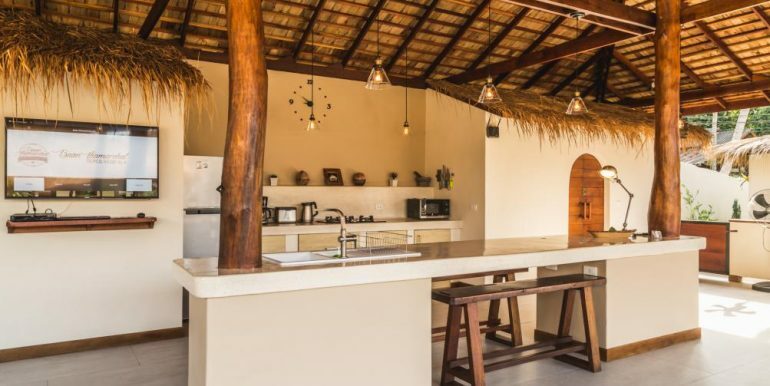 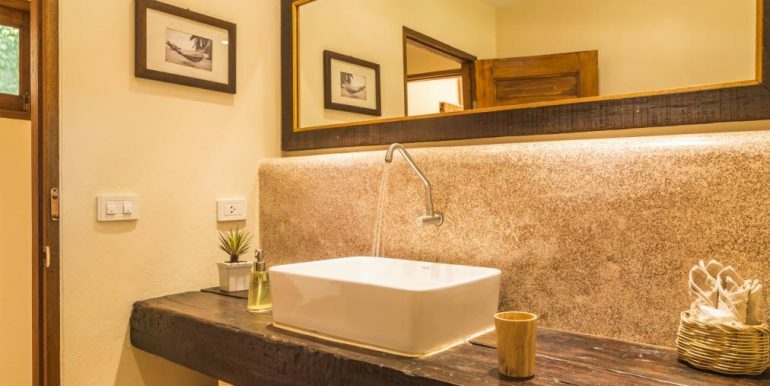 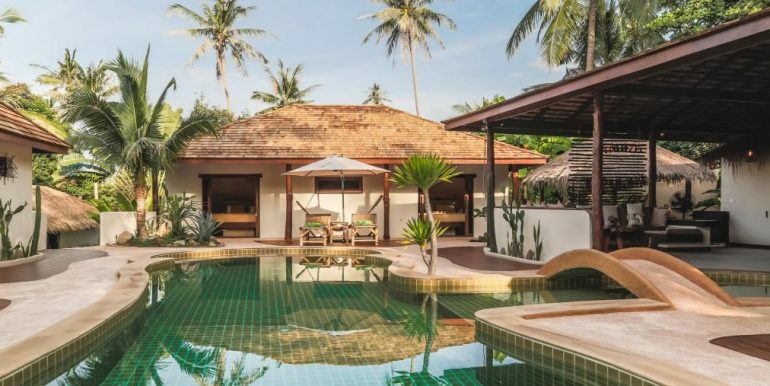 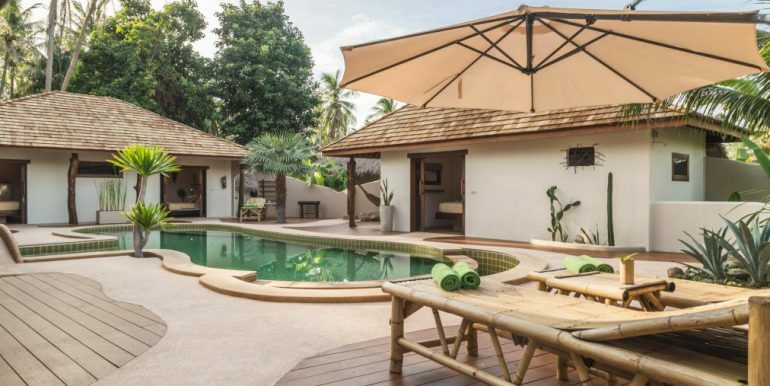 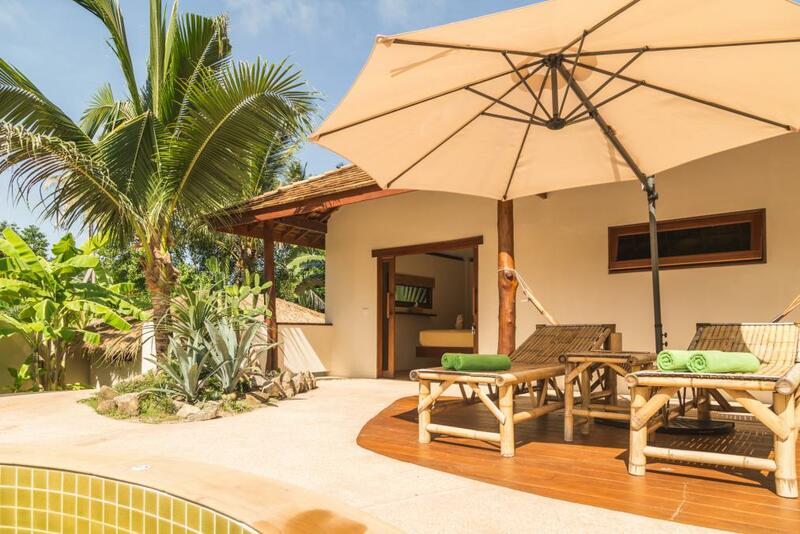 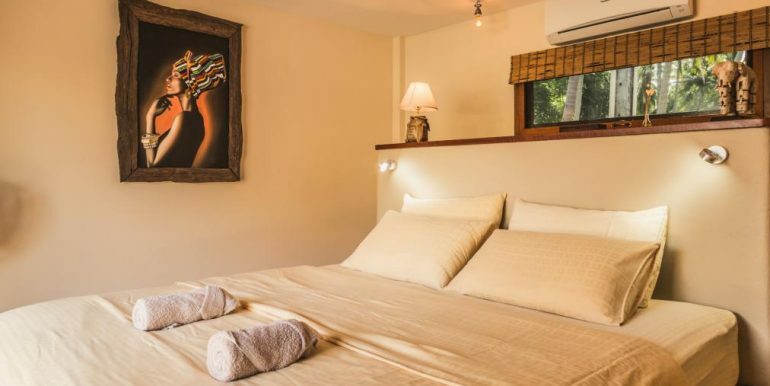 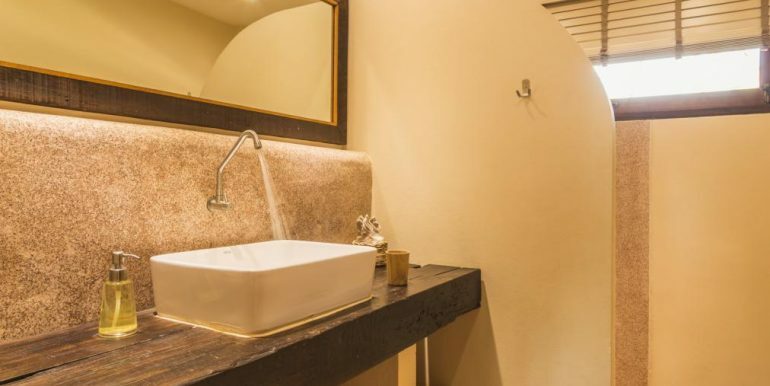 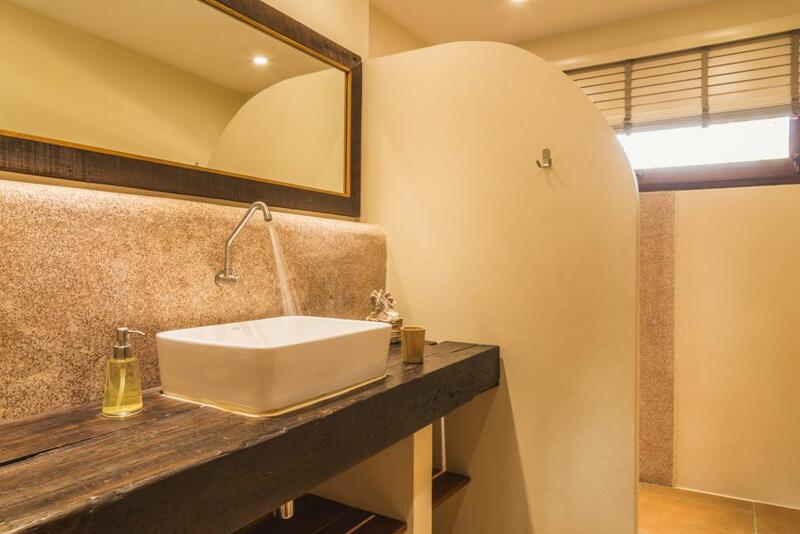 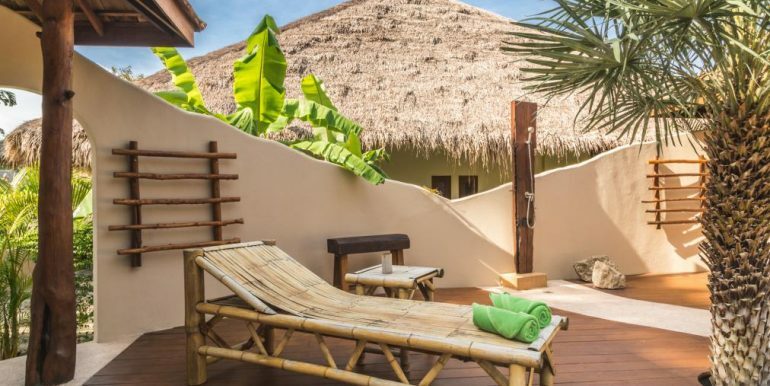 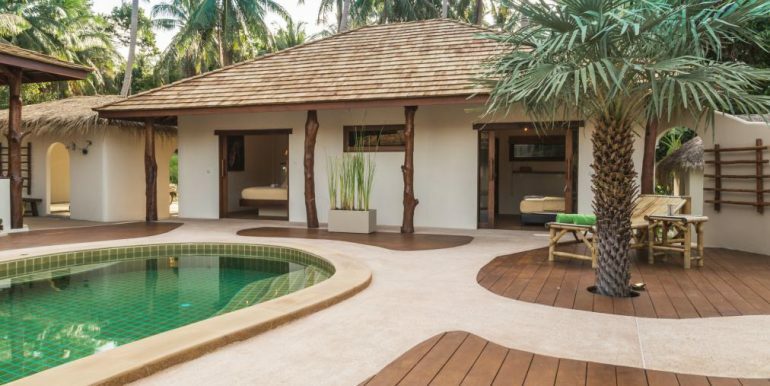 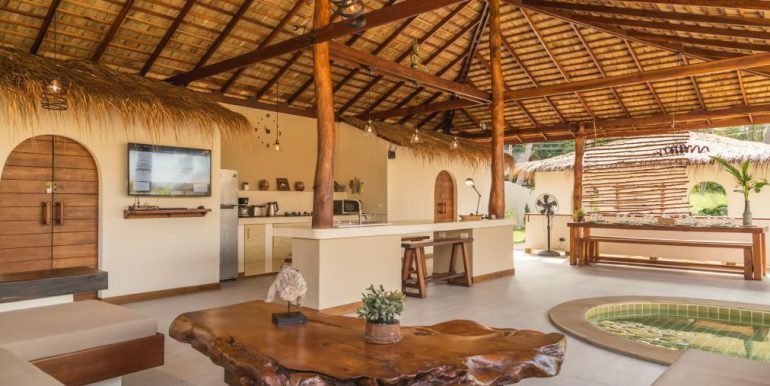 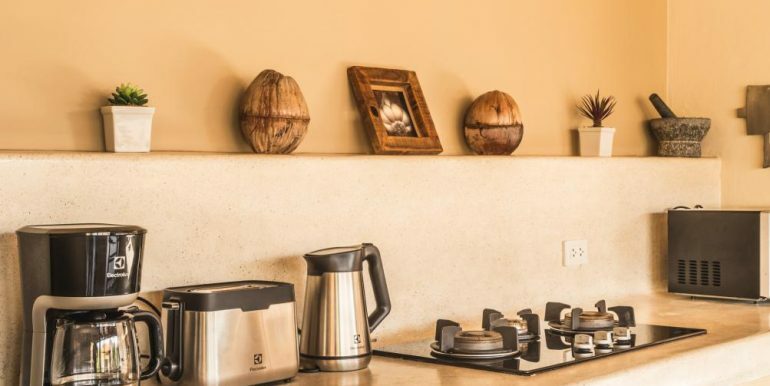 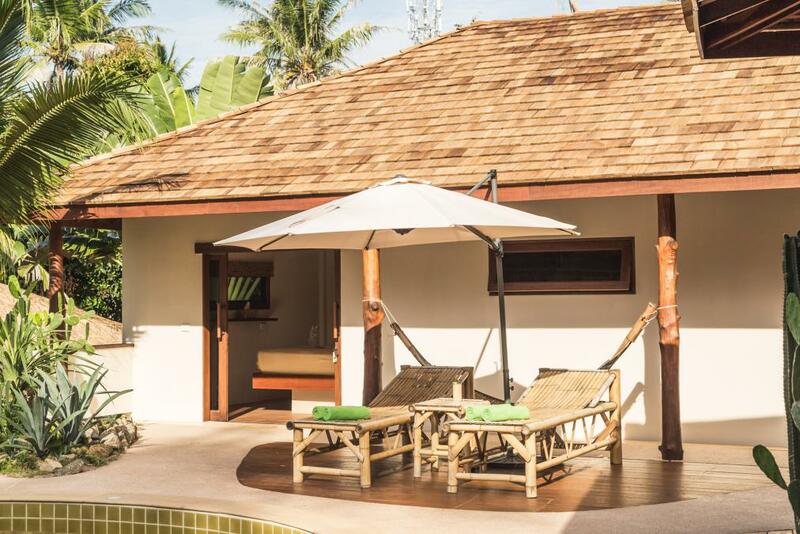 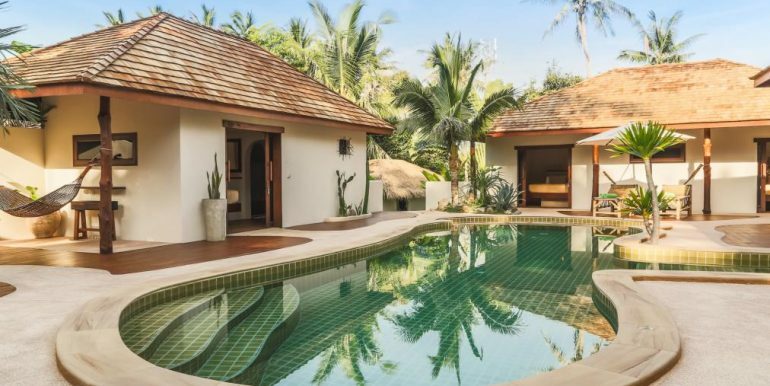 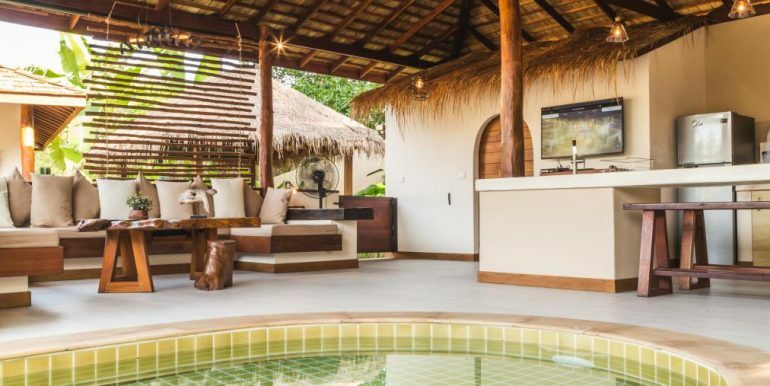 Baan Ya Kha Villa has all its bedrooms located in small bungalows around the pool, one of the bungalows has two double bedrooms both containing a king size bed and a bathroom and separate toilet.The other bungalow is very similar with two rooms both containing a two double king size beds. 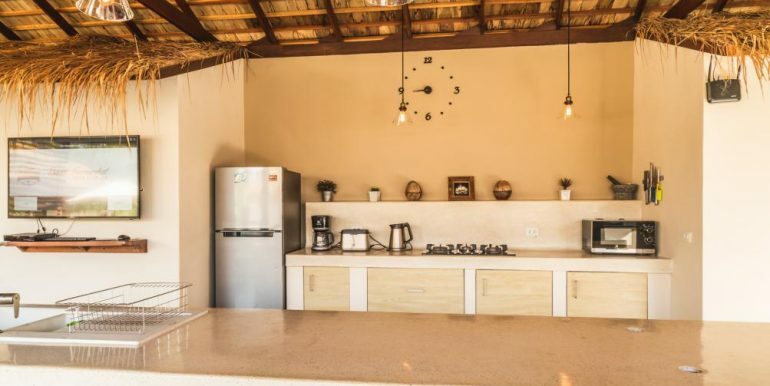 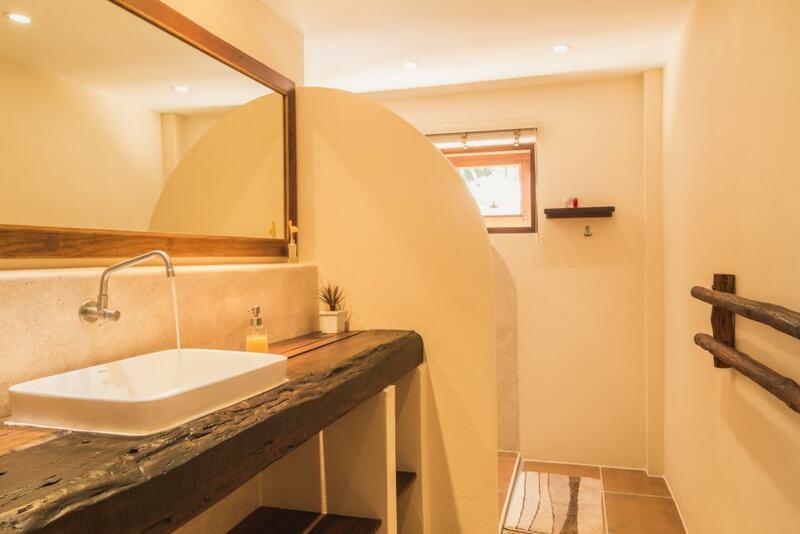 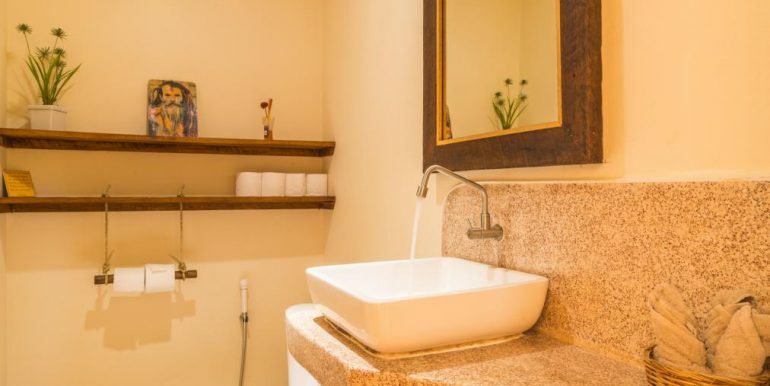 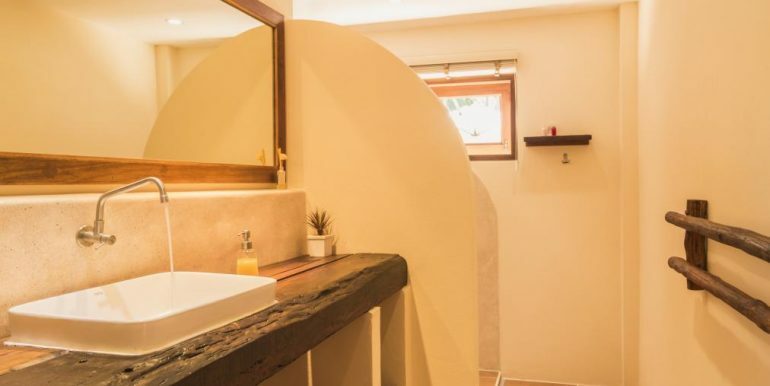 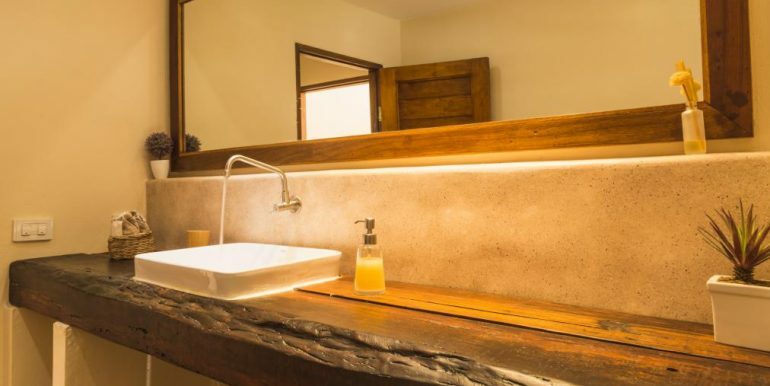 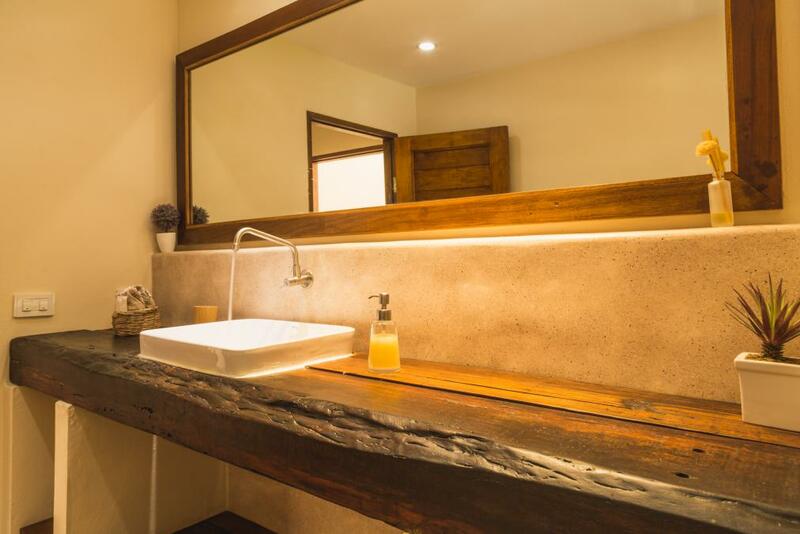 It also has a bathroom and toilet.The third bungalow is one single bedroom with a king size bed. 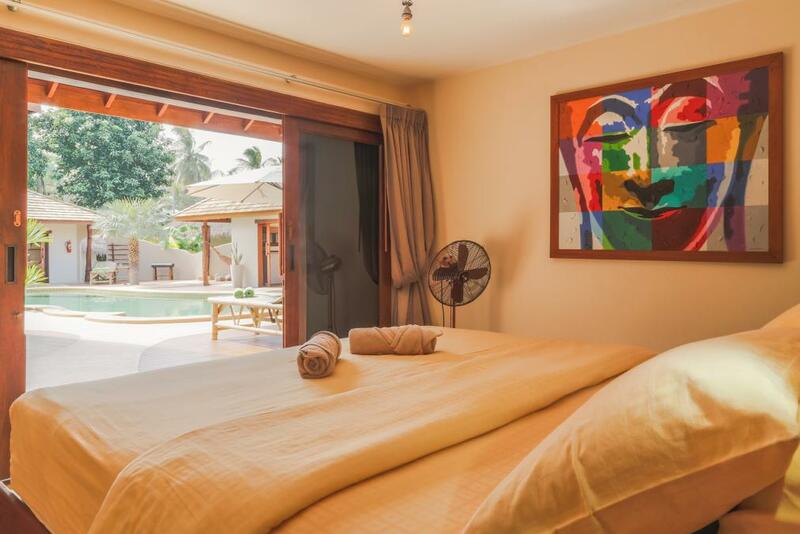 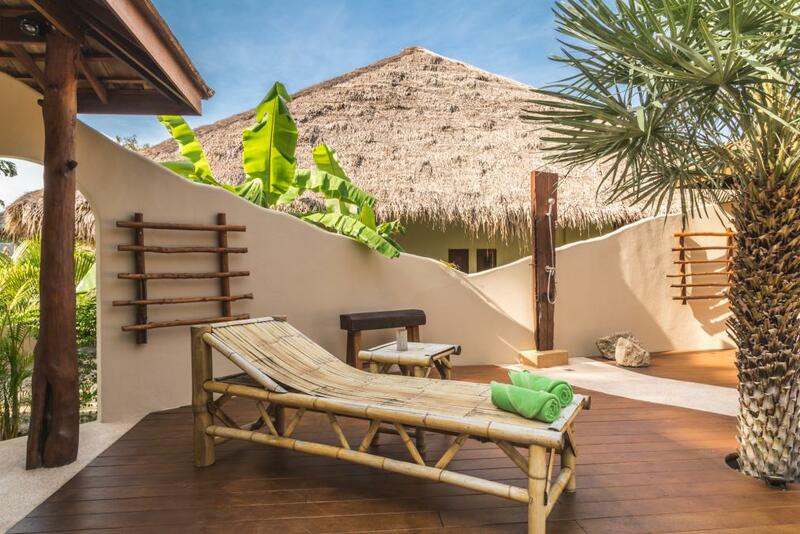 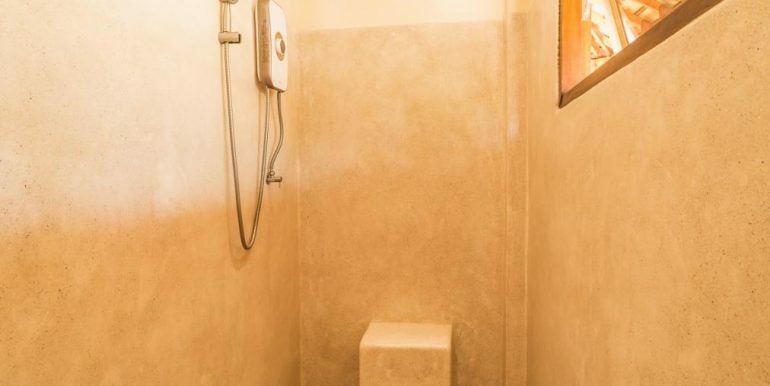 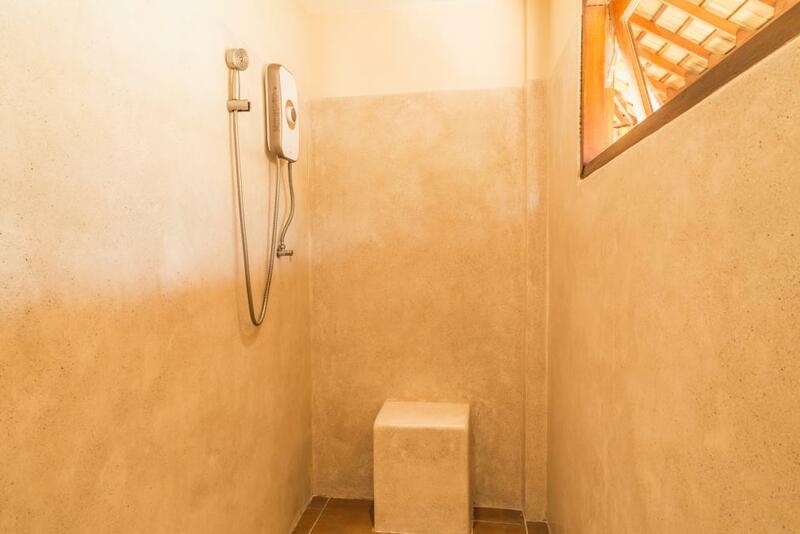 This bungalow also has a bathroom and toilet.The bungalows have fans, air-conditioning and have safe boxes. 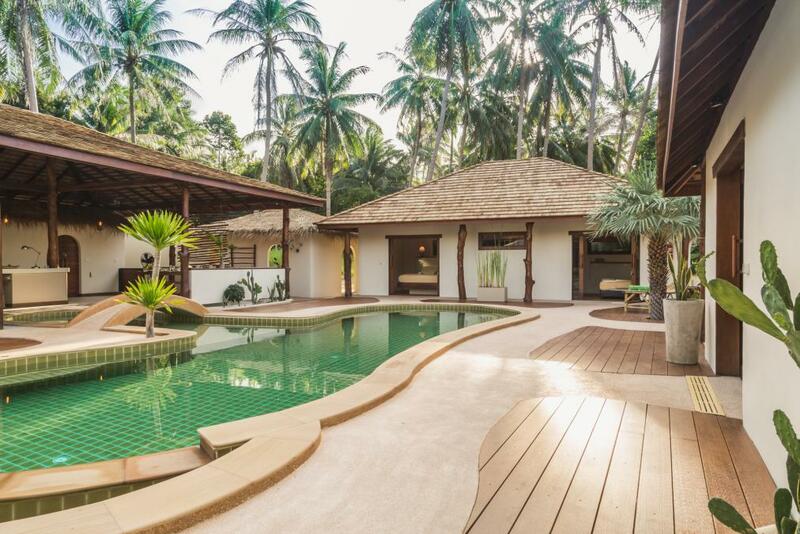 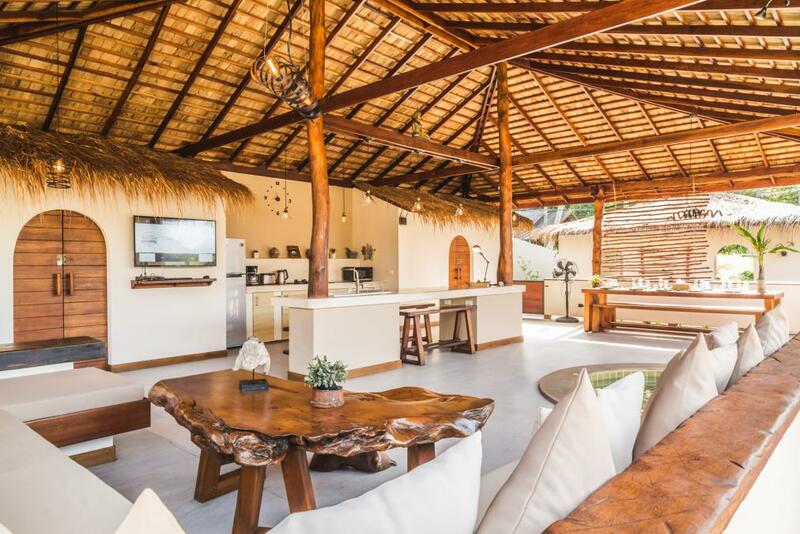 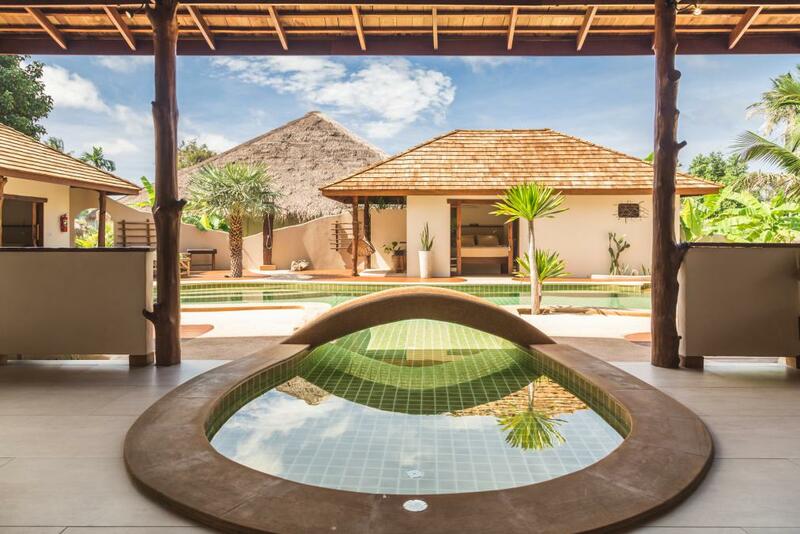 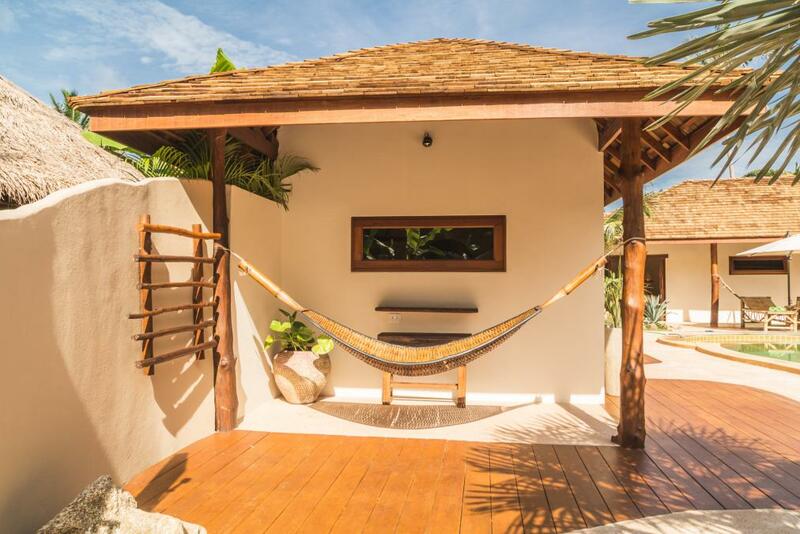 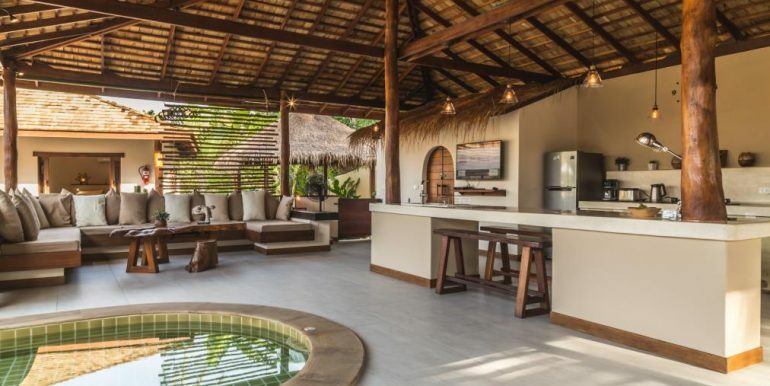 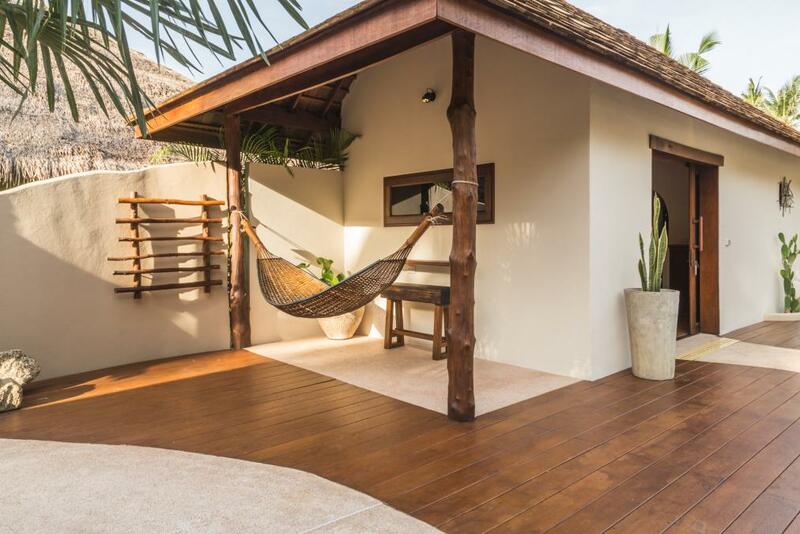 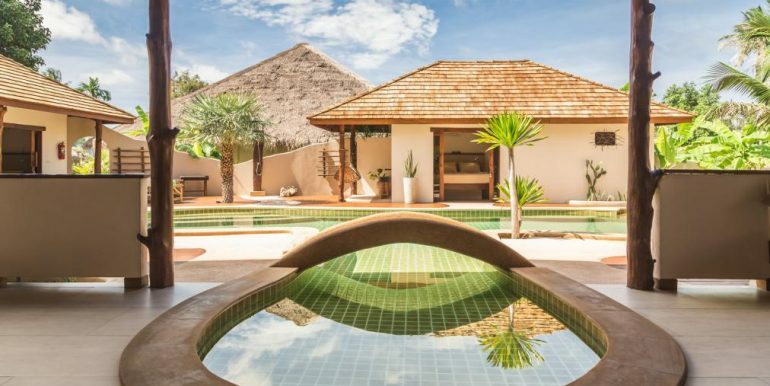 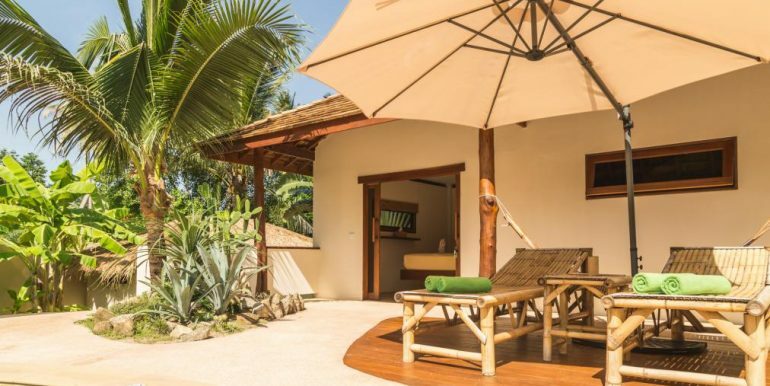 This villa is set in a natural and beautiful location. 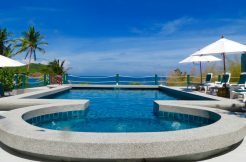 The villa is within walking distance of a 7/11 supermarket and the beach. 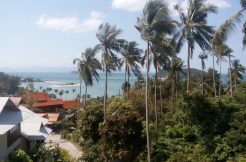 Another 10 to 15 Minutes walk is the main village of Sri Thanu, where you find a selection of restaurants, cafes and shops. 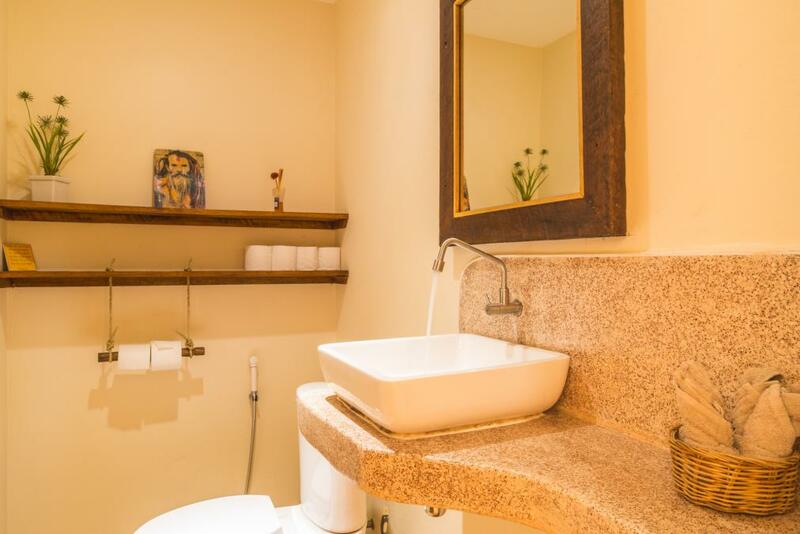 Yoga centers like Orion Yoga and Agama yoga are located near Sri Thanu.